We started our life in Mérida with the few belongings we could cram into our midsize SUV. We each had a duffle bag stuffed with clothes and personal items. Ty found out after we arrived that what he thought was another medium size suitcase of clothes was actually stuffed full of knitting and needlepoint supplies, I do have my priorities! We brought Adie’s stuff; her wire crate, her portable crate, her car seat, her stroller, her life jacket, 3 bags of food (just in case we couldn’t find her brand) a case of canned mixed vegetables (Adie loves veggies on top of her dog food), her soft bed for napping and her airplane carrier filled with toys. We brought laptops, surge protectors, cameras and an iPod docking station and one set of high thread count sheets. Ty brought a suitcase filled with miscellaneous stuff, which he would then use for his trips back and forth to work. The month we stayed at the beach was a simple time and we hardly even unpacked, same for the Casa Renta. When we bought our house, we were grateful the previous owners included some furnishings with the house. They would be leaving the stove and refrigerator, a small simple Mexican bed, a breakfast table and chairs, a patio table with chairs, a loveseat, a chair, a rocking chair, 3 lamps, a small computer desk, one ropero (a piece of furniture made to hang clothes), 2 night tables a television and 3 bookcases. We needed to buy dishes, pans, trashcans, towels, glasses, silverware and utensils, not to mention a coffee maker; you know the essentials of living. We bought another ropero and ordered a king size bed which would take at least six weeks to arrive. We bought two fold up bag chairs for comfortable sitting and two Yucatecan hammocks. We could “get by” until we completed the restyling of our house, had a pool and patio built and shipped our belongings from the States. It has been a simple existence, preparing simple meals. I am a true nester so I have tried to create a comfortable area to live in, in spite of our lack of STUFF. We gave some of the furniture we did not need to the albaniles. While Jerrie was visiting, we slept in one air-conditioned room, her on the small bed and Adie and I on a hammock, and we watched the ongoing construction from the comfort of the fold up bag chairs. I grew up in an outdoor loving family, fishing and camping trips were often and fun. 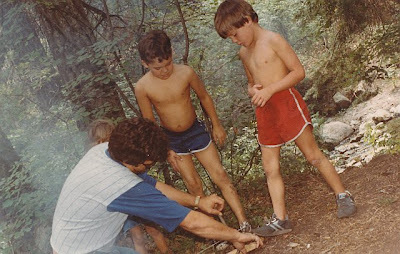 Ty camped with his Boy Scout Troop, in the mountains of New Mexico summer and winter. When we married, maybe because we loved it, or maybe we were too broke to do anything else our family vacations were mostly camping trips to rivers and lakes. 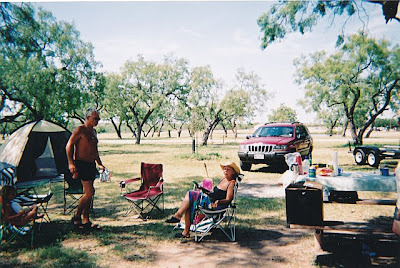 We would go to the Texas Hill Country and lazily tube the Frio River and camp. In the beginning, we cooked on an open fire, slept on the ground and had only a flashlight for light. As time passed our gear mimicked our life and soon we could easily fill up the back of a pickup truck and a ski boat with all the necessities for a few nights stay at the lake, we even had monogrammed drink koozies. In retrospect, we needed more stuff to camp for a couple of nights than many of my neighbors in Mexico need to live their simple lives on a daily basis. Since I am a nester, I would bring along tablecloths, my special camping dishes (I really dislike eating on a paper plate) and the kids and I picked flowers to grace our camp table. 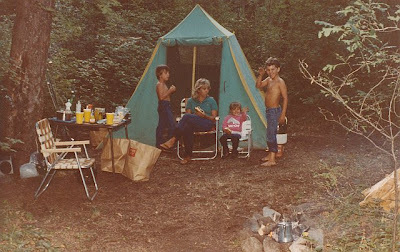 As our family grew, our kids married and had kids; we still camped even though money was not as much an issue, it just seemed like good family fun. 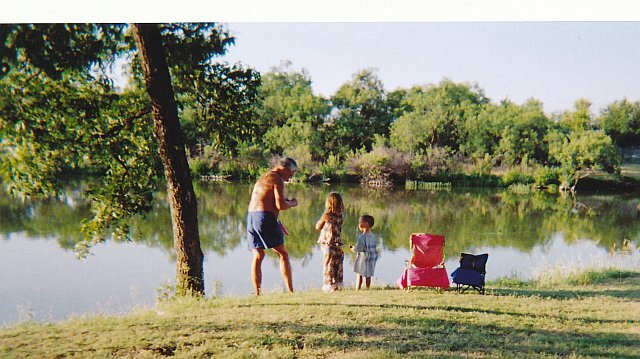 Our grown children and grandkids have expressed that some of their fondest memories are from our many camping trips. Our first nine months of living in Mexico has been………….well, it’s been like camping, only better. I love the hammock photo! Yucatango - Yeah, that is a funny picture. Adie anxiously awaits siesta time in the hammock everyday.